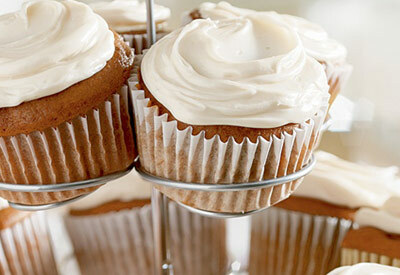 Flavorful spice cupcakes get super-moist and delicious when they're made with our secret ingredient...tomato soup. Better make a double batch...these will disappear quickly. 1) Heat the oven to 350 degrees F Place liners into 24 (2 1/2-inch) muffin-pan cups. 2) Combine the cake mix, soup, water and eggs in a large bowl and mix according to the package directions. Spoon the batter into the muffin-pan cups. 3) Bake for 20 minutes or until a toothpick inserted in the center of a cupcake comes out clean. 4) Let the cupcakes cool in the pans on wire racks for 10 minutes. Remove the cupcakes from the pans and let cool completely. 5) Frost with the cream cheese frosting.